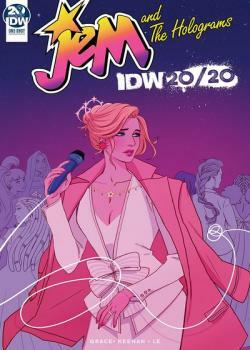 IDW 20/20 kicks off IDW’s year-long 20th anniversary celebration! An all-new weekly event giving a glimpse of your favorite characters 20 years into the future—or past! What made them into the heroes you love… and what twists does the future hold…? Jem and the Holograms are back with new music, old flames, and good friends in this adventure set 20 years in the future! Join Jerrica, Synergy, and the rest of your favorite holographic gals for a rockin’ reunion that’s sure to please old and new fans alike!